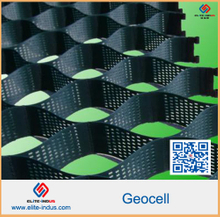 We are one of the largest manufacturers of fiberglass geogrid and plastic geocell in China. 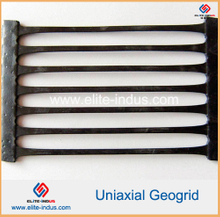 we supply best quality and good corrosion resistance plastic geogrid . 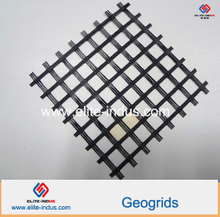 Geogrid is mainly divided into plastic geogrid, polyester geogrid, fiberglass geogrid.It is an integrally formed structure,which especially designed for soil stabilization and reinforcement applications. 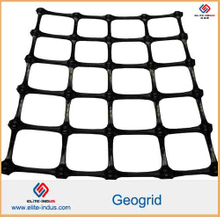 1) Plastic geogrid is mainly manufactured from polypropylene or high density polyethylene, which are all UV stabilized. 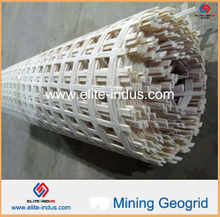 The plastic geogrid is mainly used in the construction of roadways, highways, railways. 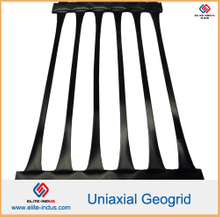 According to the stretched direction, it can be divided into uniaxial plastic geogrid and biaxial plastic geogrid. 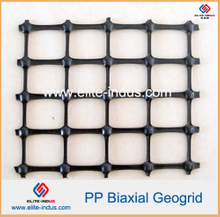 PP biaxial Geogrid tensile strength:10KnX10Kn to 50KNX50KN. Normal roll size 3.95MX50M. 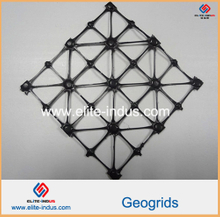 HDPE Uniaxial Geogrid tensile strength: 50Kn to 260KN. Normal roll size 1MX50M. from the process of Warp knitted,Coating. Fiberglass Geogrid (FG) is a biaxial geogrid of fiber glass yarn, PVC coated, available in strength 30 to 80 kN/m in both directions. The advantages of Fiberglass Geogrid (FG) are: extended durability of the road surface, low costs for corrective, simple, expeditious and economic installation, less process engineering, PVC coating protects the glass grid from mechanical damages, high tensile and tear strength, reduction of asphalt thickness, reinforcement and stabilization of pavement, high E modulus of the grid keeps asphalt surface movements uniform, delays cracking. and less material fatigue and better tension distribution. Polyester geogrid tensile strength:30KNX30Kn to 1300KnX1300Kn. Width: 1M to 6M, normal roll size 3.95MX100M. Fiberglass geogrid tensile strength: 30KNX30Kn to 400KnX400Kn. Plastic geocell is one new type geosynthetics material, basic sheet is high-molecular polymer, connected by rivets or ultrasonic welded to three-dimensional network structure, unfold it and fill in sand, gravel and clay etc. 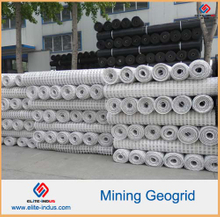 We have 4production lines of hdpe geogrid, both textured surface or smooth surface geocell. production capacity: 6000m2 a day.